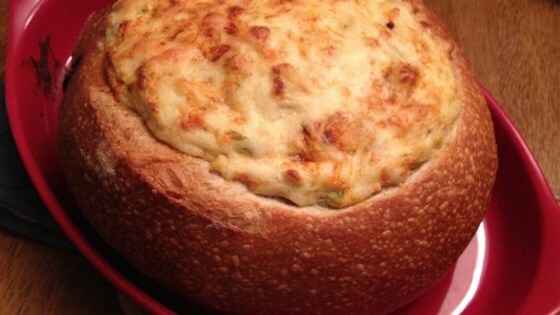 "This baked crab and artichoke dip is made and served in a bread bowl that you can eat too!" Preheat oven to 375 degrees F (190 degrees C). Line a baking dish with aluminum foil. Combine cream cheese, crab meat, artichoke bottoms, 6 ounces Cheddar cheese, red bell pepper, green onions, sour cream, mayonnaise, garlic, lemon zest and juice, tarragon, Worcestershire sauce, and cayenne pepper in a large bowl; season with salt and black pepper. Cut the top 1/3 off the loaf of sourdough bread and discard. Remove the bread filling and discard, leaving just the crust. Place in the prepared baking dish. Transfer artichoke mixture to the prepared bread bowl; top with 2 tablespoons Cheddar cheese and cayenne pepper. Bake in the preheated oven until dip is warmed and top is golden brown, about 30 minutes. See how to make a creamy crab dip baked in a bread bowl. The nutrition data for this recipe includes the full amount of the bread loaf. The actual amount consumed will vary. Kind of bland, we followed the recipe to the "T", we added more cayenne but recipe missing flavor.